8000 years ago, Nigeria. "Africa's oldest known boat" the Dufuna Canoe was discovered near the region of the River Yobe. 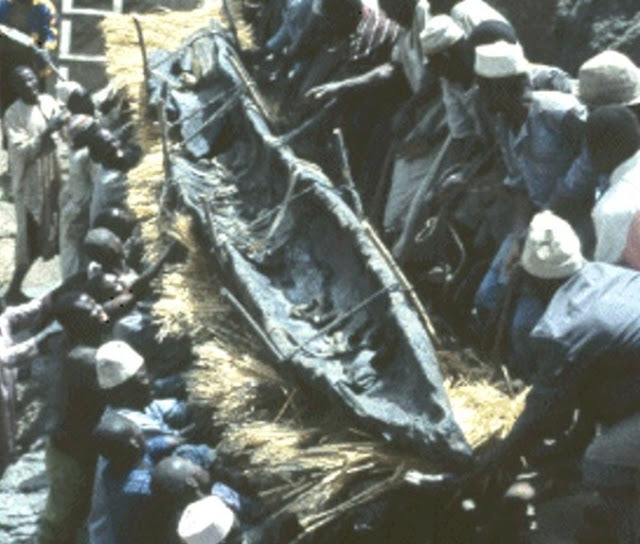 The Canoe was discovered by a Fulani herdsman in May 1987, in Dufuna Village while digging a well. The canoe’s “almost black wood”, said to be African mahogany, as “entirely an organic material”. Various Radio-Carbon tests conducted in laboratories of reputable Universities in Europe and America indicate that the Canoe is over 8000 years old, thus making it the oldest in Africa and 3rd oldest in the World. Little is known of the period to which the boat belongs, in archaeological terms it is described as an early phase of the Later Stone Age, which began rather more than 12,000 years ago and ended with the appearance of pottery. 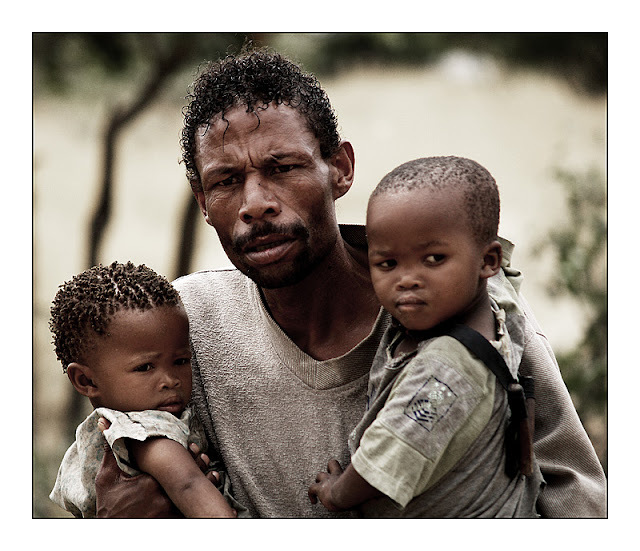 (Photo)-Nigeria. "Africa's oldest known boat" (6,000 B.C.) the Dufuna Canoe was discovered near the region of the River Yobe. Various Radio-Carbon tests conducted in laboratories of reputable Universities in Europe and America indicate that the Canoe is over 8000 years old, thus making it the oldest in Africa and 3rd oldest in the World. Ranking the Dufuna canoe as the world’s third oldest known dugout. Older than it are the dugouts from Pesse, Netherlands; and Noyen-sur-Seine, France. Which are very primitive in comparison to the modern design - even by our standards - of the Dufuna Canoe. Egypt's oldest known boat is 5000 years old. in length, 0.5 meters wide and about 5 cm thick varying at certain parts of the surface. The canoe belongs to the Late Stone Age period (Neolithic Age), when humans ceased to roam the face of the earth hunting to become herdsmen and cultivators and in the process becoming modifier of their environment with complex social structures in response to new problems and ways of dealing with situations. "The discovery of this boat is an important landmark in the history of Nigeria in particular and Africa in general" says Eluyemi. 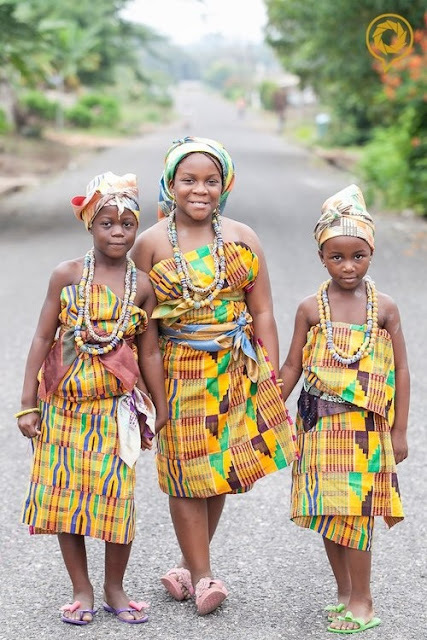 Besides proving that the Nigerian society was at par (if not earlier) than that of Egypt, Mesopotamia, Minoa and Phoenicia, the discovery also provides the first concrete evidence that Africans possessed the ability to reason and have been exploring technology to modify their environment to suit their needs. But more importantly "the canoe has shown that people in the Niger area had a history of advanced technology and that they had mastered the three major items of Paleolithic culture which were the fashioning, standardization and utilization of tools according to certain set traditions," explains Eluyemi. But beyond that, the discovery has also revealed that, Nigerians were not static people. "It gives concrete evidence of transportation by seas as well as providing evidence of some form of long distance commercial activities indicative of existing political and economic structures." One great benefit of the discovery is that it has helped archaeologists draw a relationship between what was happening in Nigeria and else where in the world during that period. 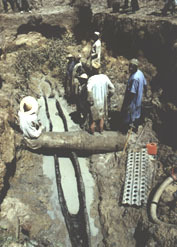 Indications are that while Nigerians were making canoes in Dufuna village in 6000 BC, the people of Catol Huyuk in Turkey were making pottery, textiles etc, like the people of Mesopotamia (present day Iraq) were forming urban communities and the Chinese were making painted pottery in the Yang Shao region. But particularly of interest to archaeologists is the proof that some form of advanced civilization existed in the Lake Chad Basin around 6000 BC. Documentation has showed that based on the minimal available technology during this period, the making of the Dufuna canoe must have been a ponderous task which called for mastery, specialization and ingenuity. A lot of work, man hours and skill must also have been put into the production since no iron tools were in existence at the time. The tools used were probably Post Pleistocene ungrounded core axe - like and pick - axe bifacial tools of microlithic appearance. It can be assumed that the canoe must have been made near a river to eliminate the difficulty of transporting it over long distances. P. Breunig, The 8000-year-old dugout canoe from Dufuna (NE Nigeria), G. Pwiti and R. Soper (eds. ), Aspects of African Archaeology. Papers from the 10th Congress of the PanAfrican Association for Prehistory and related Studies. University of Zimbabwe Publications (Harare 1996) 461-468.
this was fabulous but still wondering why the canoe was invented?